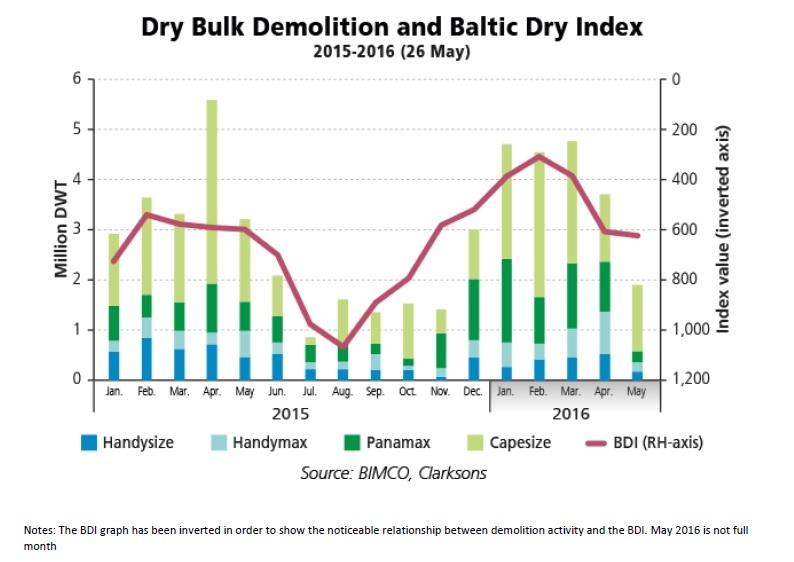 The Baltic Dry Index (BDI) ’s positive effect on capacity being removed from the fleet did not continue into Q2 2016, as capesize demolition came to a halt. 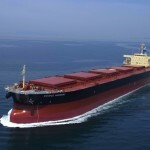 The BDI went from “devastating” in February to “poor” in April with the highest total demolished DWT ever experienced in the dry bulk market. Unfortunately, BIMCO’s earlier claim was realised when demolition activity slowed down as the BDI improved. 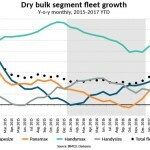 Chief Shipping Analyst Peter Sand comments, “With BDI hitting an all-time low in February 2016, the dry bulk market saw a quarterly record volume of demolished ships in the wake of it. Subsequently, demolition activity came to a halt as BDI increased from March to peak at 703 on 25 April 2016. 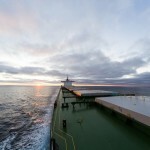 Shipowners were reluctant in the last part of 2015 to scrap, despite clear indications from the BDI, but responded positively in 2016; up by 15 % as compared to the first four months of 2015”. With the BDI declining, demolition increased in all segments except handysize, which was down 40 % for the first four months compared to the first four months in 2015. Compared to the handysize slowdown, there was a positive reaction from three other segments up until March. 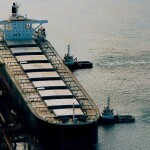 Panamax and handymax segments are holding the “banner” for demolition, while capesize had a good start but could not keep momentum in Q2. Capesize’ s reaction to a 58.5 % increase in BDI from March to April lead to a 28.3% drop in demolition from March to April in 2016. Handysize scrapping covered 18.1% of total scrapping in the first four months in 2015 but only 9.5% in 2016. Handymax and panamax, respectively, are up 81% and the 87% in 2016 compared to the same four months in 2015. They now cover 40% of total scrapping in 2016. The increase in scrapping has also seen the lowest average age in the past five years. The decline goes hand in hand with the increase in scrapping in 2016. 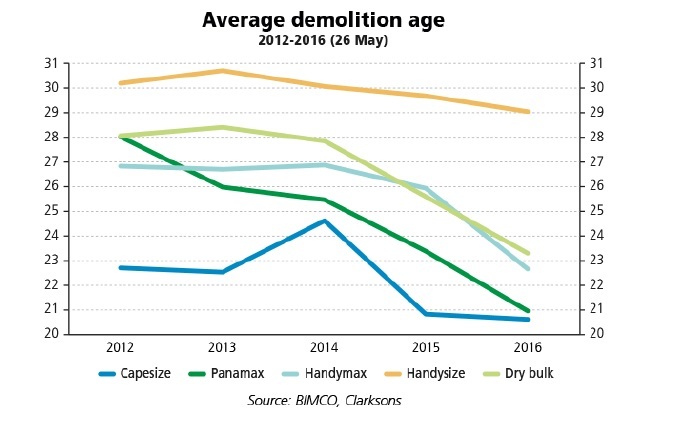 Where capesize in 2015 was the main driver lowering the demolition age, it is now the panamax and handymax segments influencing the decline from a combined 25.8 years in 2015 to 23.8 years in 2016. 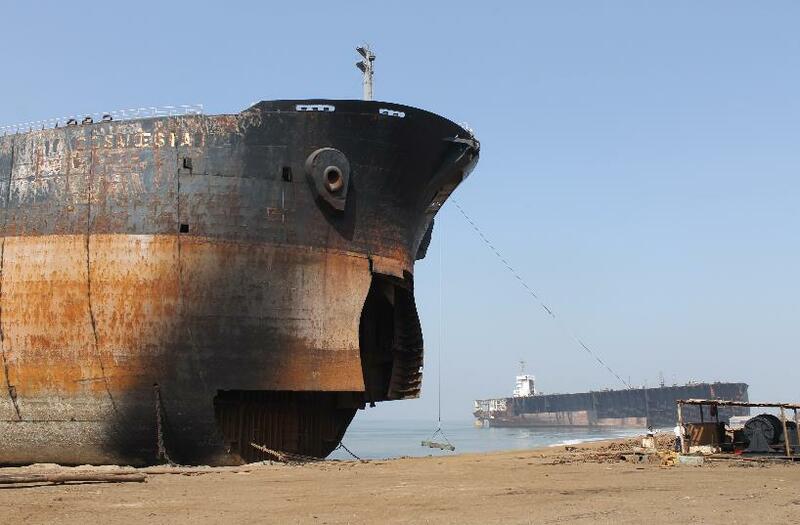 Peter Sand adds, “Despite the slowdown in demolition activity in April and May 2016 the decrease in ship demolition age continued from 2015. At an average of 23.3 years today, demolition age has decreased by 20.5 % over the past four years. 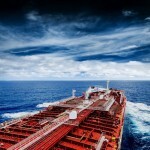 Focusing on the two larger segments, we see capesize continue its trend towards the 20-year mark, together with panamax. The industry needs to break the trend of halting demolition activity as soon as the BDI improves marginally. 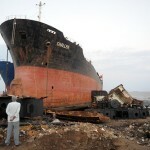 We can only improve the fundamental market conditions if shipowners are keeping demolition activity up consistently”.